For those of us that had the privilege of attending Comic-Con 2012, we were are able to get first stab at purchasing tickets yesterday morning. As it is always when Comic-Con tickets go on sale, technical issues were a huge part of the twitter updates. I had copied and pasted the link into a new window at 8:00 PDT on the dot I clicked enter. It clocked. And Clocked. And never loaded. I was on the phone with two of my friends who were also attempting to get tickets, and they were having the same problem. Eventually, my friend told me to go straight in from Comic-Con's page. This was at 8:13 AM. I heard from people on twitter that if you were able to get in between 8:00-8:05, you were able to score 4 day plus preview. 8:05-8:10- 4 days, and so on. When i entered the virtual queue at 8:13 Am i was number 19,842. I was frakking nervous to say the least. One of my friends had gotten in a few minutes before me and was number 13,000. We watched as 4 day plus preview night and then the 4 day badges disappeared. Since we didn't know how many tickets comic-con was selling, I thought for sure they were going to stop the badge line before I even had a chance to get in. By the time I got into the 3 digit numbers, all SDCC had left were single day badges. My friend called me and told me she had bought all 4 single day badges for her and the two others in her family, so I had faith that I might be able to swing a four day badge with 4 single day tickets. Finally at 8:33 it was my turn to buy tickets, and I was ecstatic to discover that the still had all the single badge days still available. I was able to score mine and 40 minutes later the rest of the badges were sold out. The badge sales seemed to go much smoother than last year since people who clicked at 8:01 were number 90,000 in line instead of 5,000 like it was yesterday morning. I still haven't heard from SDCC just how many badges were sold yesterday, but I'm assuming don't be disenchanted if you didn't get a chance to buy your badge yesterday. 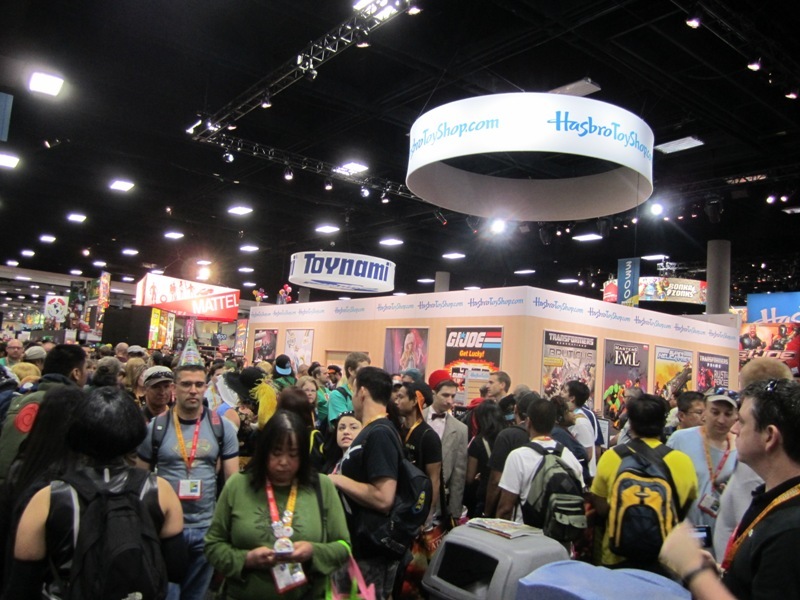 I've heard some rumors that SDCC will be selling tickets for the general public in early 2013. And if you don't get tickets then you can always attempt at the resell date. My friend scored 2 single day badges this year, and I thought for sure there was no way she'd get any; so remember, it's comic-con. Anything is possible. And if you still miss out on getting tickets both times, when comic-con had their hotel day, some of those hotel deals come with badges, so keep your eye out on that. And also, I know comic-con makes a big deal about buying badges and blah blah blah it's illegal and all that.. But if you can find someone in the industry (or on Craigslist) who had a complementary badge, get one that. Complimentary badges can be claimed on Comic-con's website and are registered in your name, so you use your ID to pick up the badge and it has your name on it. Comic-Con will have no idea. I know a lot of people were unhappy about not having the ability to get tickets yesterday, but for those that have them, god it feels odd that I feel no stress at wondering if I'm going to be able to attend the Con this year. And if you haven't already, those that are serious about attending need to book their rooms now. I called the day after I got back from Comic-Con and a lot of the rooms where I'm staying were already checked out for the Con.